The evolution-creationism debate has returned to Dayton, Tennessee—the site of the Scopes Monkey Trial. Except this time, the venue is not a courtroom but a Christian college, where faculty members have resigned and students have mounted protests. The issue? Whether Adam and Eve were the progenitors of humanity. The answer to that question depends upon where one falls on the spectrum of the creationist movement. If someone is a young-earth creationist, they believe in the literal interpretation of the Bible. 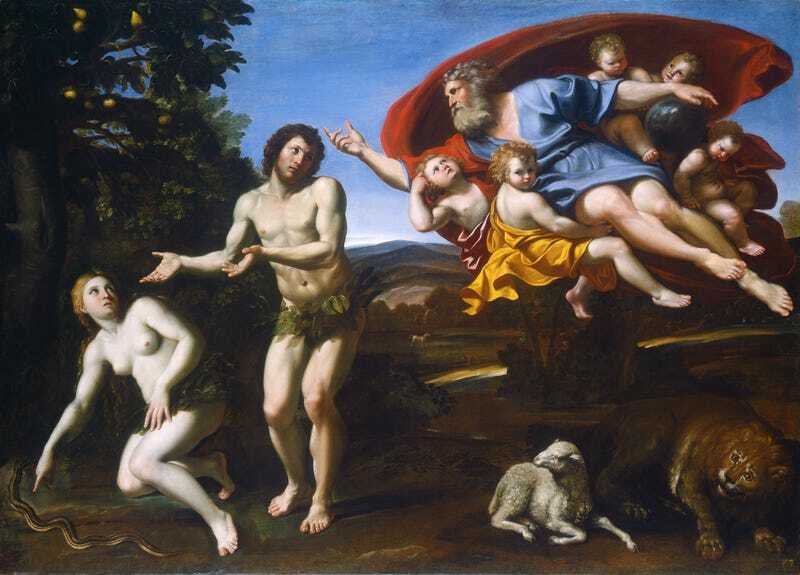 The Earth was created exactly as described in Genesis: Adam and Eve were the first humans and the parents of all humanity, and they lived happily alongside dinosaurs in the Garden of Eden until they disobeyed God and were expelled. Or, one can be a believer in theistic evolution—a range of views based upon the premise that God used the process of evolution to create all life on earth today. Someone who adheres to this belief might view Adam and Eve as a parable, or believe they were historic figures chosen to represent the rest of humanity before God. For decades, Bryan College (yes, named for William Jennings Bryan), managed to avoid confronting this issue—that is, until the school's board of trustees decided to change the institution's statement of faith. Such statements, which are common at Christian colleges, lay out the beliefs that define their respective campuses. Faculty members are obliged to sign them annually. Sometimes these documents touch upon the origins of human beings, sometimes they don't. "that the origin of man was by fiat of God in the act of creation as related in the Book of Genesis; that he was created in the image of God; that he sinned and thereby incurred physical and spiritual death;"
"We believe that all humanity is descended from Adam and Eve. They are historical persons created by God in a special formative act, and not from previously existing life forms." And thus, with an allegorical stroke of a pen, Bryan College's statement of faith was transformed into an explicit endorsement of young-earth creationism. Why this change, and why now? In large part, it's a defensive measure against genomics research—which some members of the creationist community see as the latest weapon in the scientific arsenal that is being deployed to undermine the faithful. The immediate occasion for writing this article is the emergence of recent genomic science (following the dramatic success of geneticists in mapping the human genome). When this new science becomes better known, as it soon will be, it is bound to pose even greater challenges to traditional Christian ecclesiastical and educational institutions than the ones they face already. Many genetic experts judge that the genomic evidence dramatically strengthens the theory of ancestral evolution. The new evidence will make it harder than it has ever been to justify the stances that now prevail among conservative Protestant churches…. Indeed, genomic research has enabled scientists to guesstimate the minimal population size that enabled the worldwide expansion of human beings. A paper published last year in the journal Genetics calculated that much of today's global population can trace their ancestry back to around 2,250 individuals who migrated out of Africa some 117,000 years ago. For conservative Protestants in the United States, this issue strikes at the very heart of their religious beliefs. This is much more than another debate about how humans were created; rather, it's about how humans fell from grace. The Evangelical view, stemming from the teachings of St. Augustine, is that, because Adam and Eve disobeyed God, all of humanity was tainted and predisposed toward sin. It is for this reason that Jesus Christ, God incarnate, died on the Cross. His selfless act made possible our eternal salvation. This is the crucial connection between the Old and New Testaments: the once-in-history saving act of God's son and the once-in-history fall of humanity. As stated in the Book of Romans, Chapter 5: "For if the many died by the trespass of the one man, how much more did God's grace send a gift that came by the grace of the one man, Jesus Christ, overflow to the many?" As such, conservative Protestants argue, if you deny that Adam and Eve were the progenitors of humanity, you also deny the concept of original sin. And, if that's the case, why would God have sent his only Son to suffer and die on the Cross? This is the essence of Bryan College's decision to alter its statement of faith. And it's a decision that hasn't gone over well with the campus community—not least because they find the administration's distinction between "clarifying" the statement and "rewriting" it to be disingenuous. In the ensuing weeks, the conflict has escalated, with the majority of faculty members (30-2) voting "no confidence" in the college president. Stephen F. Barnett, a professor of natural sciences, and Steve DeGeorge, a professor of education, refused to sign the revised statement, so their contracts were not renewed. (President Livesay prefers to say that the professors "rejected" the college's offer of employment.) Seven other faculty members have declared that they will not return next year. Overall, Bryan College is losing about 25% of its faculty. Kevin Clauson, vice chair of the Bryan faculty, said he voted in the minority, for the president. He said he and most other faculty members actually agree with the clarified stance, but that many of those who voted against the president objected to the timing of the announcement about the statement. Clauson said critics said it gave faculty members who could not sign only a few months to find new positions. The faculty vice chair said it was "sad" to see faculty members leaving…. "But the other side of the coin is that if Bryan is going to maintain itself as an evangelical Christian college, it has to make sure that its doctrine is firm— that there's no slippage of doctrine." Other faculty members disagree. Phil Lestmann, professor mathematics and head of Bryan's natural sciences division…forwarded a list of talking points he used at the faculty meeting preceding the vote of no confidence. Among them were "pretending that a very complex issue is really very simple and straightforward" and "possibly putting the college into too small a scientific or theological box." In recent weeks, students have also expressed their dissent. They started wearing black armbands and they set up "goodbye" tables to write notes and express solidarity with departing professors. They've also taken to social media, adopting a logo with a purple hand, along with the words, "Hear my voice." "We believe that the current motion will alienate faculty, our brothers and sisters in Christ, by requiring them to affirm a negative on an ancillary matter of faith," the letter says. "We believe that the expertise and opinions of faculty have been largely if not entirely disregarded in the making of this decision. We believe that there has not been sufficient counsel sought, as per Proverbs 15:22, of those the college has hired specifically for their breadth of wisdom." "We believe that it is unjust that professors who gained tenure, published research, and served faithfully under this old statement of faith will be either fired or be forced to choose between violating their consciences or providing for their families." Unsurprisingly, veteran commentators from various sides of this debate have been following the events at Bryan College. Two, in particular, stand out for me. One is young-earth creationist David Coppedge, a former employee at the Jet Propulsion Laboratory, who unsuccessfully pursued a "wrongful dismissal" lawsuit a few years back, claiming that he had been fired because of his religious beliefs. If the Bible-compromising profs want to go, let them go. Good riddance. They applied knowing what the college believes…. If the professors love the world more than the Lord, let them go to the disgraced halls of secularism where terrorists are praised, where sexual orgies are promoted, and where conservatives are shouted down in the name of "free speech." If the profs go, the lines are drawn. Then we can debate them as secularists on the evidence. Let the theistic evolutionists defend the sorry record of human evolution. Let them explain upright, big-brained humans going hundreds of thousands of years grunting in caves rather than building cities or inventing technology. Let them explain the genetic evidence that not only supports the Genesis account, but makes the secular millions-of-years story untenable….Let them toss their Bibles into the trash and show their true loyalty to Darwin-Baal. Better that than have them pretend to ascribe to "Christ above all." Remember, though, that what the students are objecting to is simply the new rider about Adam and Eve. They apparently don't have any quarrel with the equally ludicrous claims about the creation of humans and Original Sin. As usual, you can pick and choose which statements of the Bible can be read as metaphor, and you don't need good reasons…..
Bryan is fighting a losing battle, but it will be a long battle. These vestiges of superstition, and of blind adherence to it, will eventually disappear as America becomes more secular. There will always be Biblical literalism, but I'm confident it will slowly wane. But it will wane not with the changing of minds, but over the corpses of its adherents, as the older generation dies off and the younger, exposed to secularism and doubt on the Internet, begins to ask questions. (It's telling that it the students of Bryan College are the biggest protestors.) I am patient, for I know this change won't happen in my lifetime. But I also know that in one or two centuries, Adam and Eve will be regarded as we now regard Zeus and Wotan. Coyne is several magnitudes more rational than Coppedge. Yet, the underlying sentiment of both these statements bother me, in that they suggest a false dichotomy between faith and science—the idea that you can believe in the Bible or you can believe in evolution, but you can't believe in both. I think otherwise. Ever since Darwin first published On the Origin of Species, many theologians have reconciled evolution and scripture in ways that are not only elegant but that, in my view, have inspired new ways of thinking that enhance the tenets of existing belief systems for the better. For instance, Coyne argues that Adam & Eve and the concept of Original Sin are destined for the dustbin of history, because these are literal interpretations of the Bible that can never truly be reconciled with the mounting scientific evidence that proves otherwise. I think when you have to make it a story which involves two particular people in the past and tie it to their being two people which generated the human race and their action alone caused this, I think one is being misleading. What I see is human beings emerging into consciousness, emerging into a sense of values, of truth, beauty, and goodness, but at the same time being free so they can reject those values. They can become beasts as well as angels, if you'd like. And this fact is what alienates us from each other and from God. We're not yet what God intended us to be. So when one sees that in the evolutionary perspective, we see human beings, as it were, going upwards but with greater risk of falling….What we see more is something like the Eastern Orthodox Christians see— namely, a growing of human beings towards God and that the work of Christ is to help people to grow up, to grow into the image of God which we human beings, as Christians, say we see in Jesus the Christ. The clear implication of science is that, at the dawn of human consciousness and its moral awareness and capacities for virtue, altruism was the challenge for humanity in the future, not the original primal condition of human beings in the past. [But] influential contemporary Protestant writers presume that the world that came about in consequence of the Original Sin is "not the way it's supposed to be." Entire Protestant college curricula are built uncritically upon this questionable Augustinian foundation. Major eastern theologians, however, read the Genesis story quite differently than Augustine did and western theologians have mostly done. And even in western Protestantism, there are notable exceptions… The great Irenaeus of Lyon, for instance, apparently did not think it plausible that the Fall was the outcome of an experiment that might well have gone the other way, and which foiled God's original plan, forcing God to adopt an inferior "Plan B," including the Incarnation and death of Christ. It seemed entirely implausible to Irenaeus that God could fail that way in the first place, or that in the fullness of his knowledge, power, and love, that God did not always plan to create the best world possible in and through the saving triumph of Jesus Christ. For Irenaeus and other eastern theologians, then and now, the Incarnation and the Cross together compose the purpose of creation from the beginning. In that regard, I don't think anyone can say with any degree of certainty whether the recent debate at Bryan College is an isolated event or the harbinger of new rifts among conservative Protestants. All that I can say for sure is that, as science moves forward, there will always be those who choose to remain steadfast in their current beliefs and those who will see it as an opportunity to adapt and deepen their faith—and, dare I say it, evolve.